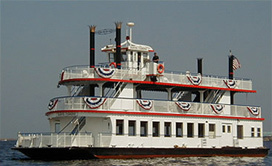 Experience our super fun and relaxing private lobster clambake cruise on historic Boston Harbor! Your Captain will chart your course to see amazing panoramic and scenic views of the city. Cruise under the Tobin Bridge, see the harbor islands, and jets arriving at Logan International airport. Boston Harbor is the perfect backdrop to kick-back and socialize with your colleagues after your meetings. Enjoy delicious fresh lobster served up buffet-style, gluten-free, veggie options available, too. We’ll show you a great time. Show your appreciation for your wonderful employees, celebrate new projects completed, as you escape the hustle bustle of the city for a few hours!Include bar with sodas, cold beer, wine or cocktails. per hour. INCLUDES OUR AMAZING 2 1/2 HOUR BOSTON ADVENTURES TEAMBUILDING SCAVENGER HUNT™ – Experience Boston and our historical sights and more. Clues lead you to fun landmarks and places, taking pictures together and finding things, enjoying some friendly competition, ending at the boat with an exciting awards ceremony with fun prizes, engraved medals and colored ribbons and a giant trophy for the office! AVAILABLE FOR CORPORATE TEAMBUILDING MAY THROUGH DECEMBER / BOOK NOW AS SPACE IS LIMITED! We provide Round-Trip Deluxe Transportation by coach or custom vans. I would like to compliment you and your staff on running the Pepsi-Cola Company Outing / Scavenger Hunt for us. It was a great experience. We couldn’t have been more pleased with your suggestions, professionalism or the complete outcome. The entire staff was helpful, knowledgeable and very courteous. I would recommend that type of venue and Boston Adventures, to anyone. Again, thanks for your time and enthusiasm!